Flat kites are inherently unstable. This problem can be overcome by making the surface facing the wind slightly convex. Then, if it tips slightly in either direction, one side of the kite is facing the wind flatter, and the other side at a greater angle. This results in more lift on the side flatter to the wind, so restoring the kite to an equilibrium position. the cross spar may be made in two pieces and set at a slight angle, known as a "dihedral", where they join in the middle. Plastic dihedral fittings are widely available for the purpose. In principle, any kite that is traditionally bowed could also be made as a dihedral, and vice versa, and for this reason we group them together, even though most are traditionally made in one form or the other. But whether, for example, an Eddy kite (originally bowed) is still an Eddy kite if it is built with a dihedral is an esoteric point upon which opinions differ. Rather than arguing about it, I'd much rather go out and fly one! The Malay and Eddy kites, in their prototypical forms, are both bowed kites in the traditional diamond shape, varying only in their proportions. Indeed, the average kite enthusiast would be hard pressed to identify a given kite as, say, a Malay rather than an Eddy. This picture is definitely one or the other, but don't ask me which! William Eddy, a journalist from New Jersey, was motivated by the desire to lift meterological and photographic equipment, for which he needed a good steady flyer. He seems to have been aware of the existance of bowed kites from Java (the Malay kite) but, being unable to obtain reliable information about them, reinvented the form himself. His kite rapidly superceeded McAidie's flat barn door kite for meterological purposes. Modern diamond kites may be either bowed or dihedral, and may have a keel both to aid stability and to avoid the need for a bridle. Such kites are sometimes loosely refered to as Eddys or Malays even though they may differ significantly from their antecedants. In particular, Eddy's kite had a bowed cross-spar and a loose sail, the sail folding back against the spine so as to form a keel at its lower end. This also aided stability, but Eddy's seminal contribution was that he was apparently the first person to explain (and so exploit) the stabilising effect of a bow or dihedral. Malays and Eddys are good light to moderate wind flyers. However, the smaller toy shop examples often need a stiff breeze to fly well since with a smaller sail area the lift to weight ratio is less favourable; a minimum size of spar is required to survive enthusiastic handling by children. Another factor is that some such kites rely on wind pressure to induce the bow, without which they tend to fly in circles, or more often a semicircle ending in a meteoric collision with a used planet, inconsiderately left in their path by a profligate civilisation! Charlie Charlton gives a very simple plan entitled "So you want to make a kite". Using three spars instead of two results in the barn door kite, which consists of one spreader and two longerons on a pentagonal or hexagonal sail. The longerons may be parallel, or may converge or meet at either the top or bottom, giving five variants. A sixth variant is the hexagon in which the longerons cross at the point where they also cross the spreaders. Whereas McAidie's flat barn door kite was rapidly superceeded, bowed barn doors are still built and flown today. A 3-, 4- or 5-legged bridle is normally used, depending on the variant and the size. Visit Don Matthews gallery of barn door kites. The sanjo rokkaku (or rok, for short) is a traditional Japanese bowed kite, which in its original form, was highly decorated (as is typical of oriental kites), and was used in kite battles. The sail is hexagonal with straight sides, but (as shown in the sketch) it flexes into an attractively curvaceous shape in the wind, which may in part account for its popularity! The bow and the large sail area make it an excellent stable lifting kite, which, together with its simple construction, make it a favourite amongst enthusiasts today, whether for lifting parachuting teddybears, displaying "line laundry" (windsocks etc), providing a canvas for an artistic talent, or simply for drying the kids' swimsuits on the line! The lower cross-spar is bowed slightly more than the upper one for stability. Although wood, such as dowelling or bamboo, can be successfully used for spars, care has to be taken to ensure that it bows evenly along its length. An unevenness not easily measured, was sufficient to make my first rok (39k) fly at 45 degrees. This applies to a greater or lesser extent to all bowed kites; use of fibreglass for the cross-spars overcomes this problem, but it's still important to make the kite symetrical and evenly balanced. Several sets of plans are available on the net, probably the most detailed being Charlie Charlton's 1.2m Rok ©Charlie Charlton. B. F. S. Baden-Powell of the Scots Guards and brother of the founder of the Scout movement, was interested in kites for their military reconnaisance potential. His "Levitator" kite was essentially similar to a large rok though having additional cross-spars in the larger sizes. He doesn't seem to have fully appreciated the benefit of a bow or dihedral; the only reason his kites were (moderately) stable is that the cross-spars were sufficiently flexible to bow under wind pressure. Nevertheless, he succeeded in lifting himself and others to heights of around 100ft with trains of 4 to 7 of his kites flown from two lines tethered some distance apart to help stabilise them. In 1901, Marconi used a Levitator kite to lift his aerial to some 400ft for his historic first transatlantic radio tests. The choice of kite was plainly not ideal since his first attempt resulted in the loss of a kite, and he barely succeeded with the second, faced with violent instability. The delta kite has a keel to aid stability, and this also serves as a bridle. Small ones sometimes have loose fringes on the trailing edge which act like a very short and narrow tail. However, if the cross-spar is too tight it can be unstable as it mainly relies on bowing in the wind for stability. It's a good light wind kite which flies with the line at a high angle on account of its high aspect ratio. Cheap plastic deltas are often seen for sale at beach kiosks, and seem to fly well in hardly any wind. In fact, I've often seen them still flying when I couldn't find anything in my kite bag that would stay up! An excellent site dedicated to delta kites is well worth a visit. It also includes fascinating details of how they have been used with great success in training falcons! Eden gives plans for several variants of the delta. Online plans for several variants are also available. Charlie Charlton has plans for yet another delta variant. Here is a picture ©Charlie Charlton (10k) of it. 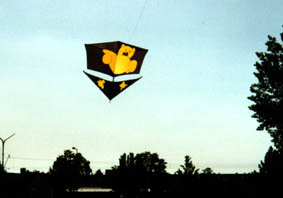 The Genki is a high aspect ratio kite with a multi-legged bridle attached to flares on the underside. It can stand out from the crowd as something a bit out of the ordinary since it lends itself to bold patterns and designs. Here is Anthony Thyssen's Australian Flag (8k) genki. There are plans on the net for several genkis, such as Carl Crowell's Traditional Genki. The Roller kite is an exceptionally steady and graceful flyer which is normally built as a dihedral kite. It's similar to a rok in many ways except for the vent and fins, which give it even greater stability. Its name has nothing to do with the way it flies but comes from its antecedent the "Roloplan", manufactured in the '30s by the German toy manufacturer Steiff, from which its name is derived by corruption. The Roloplan's name is probably related to the fact that it lent itself to being rolled up for storage and transport, but could also be related to the German for a blind or shutter. It became popular in London where its ability to rise quickly in confined spaces made it suitable for flying in small parks and open spaces. Later (in the early 70's) it was refined and much simplified by Alick Pearson into the roller, as known today. Plans are given by Pelham but in greater detail by Eden. Thomas-Michael Rudolph gives online plans, and the same site also gives plans for the original Roloplan, which give an interesting insight into where the Pearson roller came from even if you have no intention of building one. Here is a roller (11k) built to TMR's plan by Patrick Mann. The use of wind pressure to induce a stabilising bow in cheap kites tends to lead to unsatisfactory results in light winds. This vice is refined into a virtue in fighter kites such as the Indian Fighter and the Nagasaki Hata, and a number of other traditional oriental kites. These differ from each other only in slightly different sail designs, but all rely on a very flexible cross-spar, traditionally made of split bamboo, although thin fibreglass rod can be used. Paper is the traditional sail material but mylar foil is now used for its greater durability, and Western copies often use ripstop, making them much more rugged though less responsive. In the East, fighter kites are used in battles, with lines impregnated with ground glass (known as manja) in order to cut opponents' kites out of the sky. It is by no means unusual for someone to put up a kite from the roof of his house and to be engaged in battle by another flyer from a distance of 1000 yards (yes, a thousand!) Nor is it unusual for people to fall off their roofs in the excitement, or for children to get injured by traffic as they run through the streets after defeated kites. And in Afganistan, kite-flying has been banned because of the danger to children chasing kites across minefields. These kites are controlled entirely by line tension. As the flying line is allowed to relax the kite becomes flat and flies in circles, but as soon as tension is applied, the cross-spar bows and the kite flies off in whatever direction it was pointing at that instant. With a well balanced kite and a little practice, it is possible to set it in rotation in either direction at will since it always tends to start rotating in the direction which takes it quickest to 12 o'clock. Although becoming an expert takes years of practice, you can master the basic technique in ten minutes, and it won't be long before you can impress your friends. They won't know whether it's going where you intend it too! Flying a fighter is like nothing else; someone (I forget who) compared it to having a leaf, dancing in the wind, on the end of your string. Even though you may have no hope or ambition of becoming an expert, a fighter is so easy and cheap to make or buy that no kite flyer should miss the experience. One man launching is tricky for a beginner, and if you have to learn by yourself, your first fighter is likely to take a beating. Launching from your hand is possible but difficult because control is very hard on a short line. The alternative is to make or improvise a launching stand to hold the kite upright and facing the wind but leaning back, while you unwind 30 - 50ft of line. A firm pull will then launch it straight up. Concentrate on maintaining altitude while you get the hang of it. Normal practice is to use a spool from which you can pull line continuously as you need it. As you pull the line in, you let it drop at your feet in a pile from which it can be let out again as needed. Plans are available on the net for several fighters, such as this Indian Fighter, and this Hata (both in French, English translations available for the Indian Fighter and Hata). Patrick Pann has some useful tips on splitting bamboo. If fighters intrigue you, there is an excellent fighter kites web site with many pictures. It was invented by Alexander Graham Bell, better known for his other invention, the telephone. Some have suggested that he should have stuck to kites and saved the world from a veritable scourge, but in fact, his kite experiments post-dated the telephone and were funded by the modest wealth the earlier invention brought him. Bell's kite, often simply known as the Tetra, is a real head-turner, and is highly stable, given a fresh wind, on account of the large dihedral content of its structure. However, it requires a lot of sparing, and the weight of this together with the high angle at which the lifting surfaces are set to the wind result in a low angle of flight. Another unusual feature of the tetra is that it can be made in any size simply by combining a suitable number of identical cells. A single tetrahedral cell is a poor flyer, but a 4 cell tetra flies reasonably well, if a bit wobbly. In fact, the performance improves progressively as you increase the number of cells. In 1907, Bell built a tetrahedral kite which he called the "Cygnet", consisting of 3393 cells, with an opening in the centre to carry a man. Equipped with floats and towed by a steamer, it flew beautifully for 7 minutes over Baddock Bay, Nova Scotia, carrying Thomas Selfridge of the US Army. The descent was so gentle that, with his vision obscured by the structure around him, he was unaware that he was coming down until the kite touched the water. Unfortunately, the line from the steamer was not released quickly enough and the kite was destroyed as it was dragged through the sea. Nevertheless, Selfridge escaped with nothing worse than a dunking. The hardest part in building a tetra is in joining the spars. Three different types of joint are required, and if each is designed to hinge in a particular way, the whole structure can be folded flat - a big advantage for transportation. A tetra may seem a formidible kite to build, but in fact you can make your own very easily out of drinking straws and mylar gift wrap, held together with thread and sticky tape. Rob and Tony have plans for more robust tetra, using rigid spars, which is hardly more difficult, though rather more costly and time consuming. Their site also has pictures of their creations. An interesting alternative method of construction using internal bracing for the cells is given by Eden, although this doesn't allow easy collapsing for transport. Here is a picture of one of Anthony Thyssen's tetras.